Week 2 - I'm still struggling to get into the zone. My eating has been a hit & a miss this week - very much up & down. I'm desperately trying to keep on track. Here's how I've gone with this week's challenges. I didn't ditch the scales, I'm afraid I need them just now. I need to go to slimming class to keep me on track. It would be so easy to let the pounds I've lost creep back on. I was 1/2 pound down, at least it's going in the right direction, but I know I am capable of much more. Now I love wordle, they just look so cool. I played around with it & decided to use words about how I wanted to feel or what I want to achieve. I revisited my Myfitnesspal profile page & it reminded me 'Why I want to get in shape' and 'My Inspirations'. 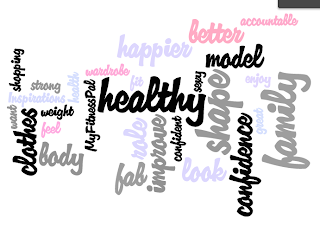 It was good to come back to these reasons & a wordle is a great way to keep these in focus. So I am going to print out my pretty wordle & put it on my fridge. I have no excuse, I just haven't done it. This is also one of my goals. So next week I will definitely be back on it! As I write it's making me want to do better. I want to really take on this challenge. This week I am really going to plan meals & track to keep on track. 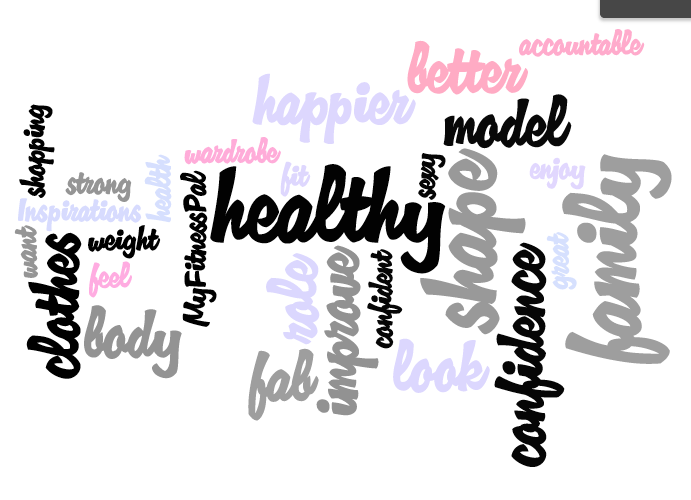 Wow, wordle is amazing! Thanks for linking to it! and yes you can definitely do it, it just takes a little bit of time getting back into the groove. Hang in there!